BALTIMORE — John Floyd from Park Heights was convinced he needed extra auto protection after seeing a CarShield TV commercial. "I'm on a fixed income because of spinal disabilities in my back, and when I saw it on TV, I knew if I had a transmission failure, I wouldn't have the money to pay for that," said Floyd. He bought the extended service protection plan from CarShield for nearly $3,000, and a few months later, he had transmission issues. "I take it to the dealership, the dealership recommends a brand new transmission, you all refuse the dealership," Floyd said. The administrator of the auto service contract, American Auto Shield, wouldn't pay the claim and Floyd was stuck with a nearly $700 car rental fee. The service he thought would have his back left him struggling to find transportation to doctors appointments. "This is a product in which we have a high volume of complaints, collectively, over a thousand complaints specific to this industry," said Angie Barnett, president and CEO with the Better Business Bureau serving Greater Maryland. Barnett said the BBB has received nearly 300 complaints against CarShield in the last three years, and 176 against American Auto Shield. Recently, the BBB issued a warning to consumers about the vehicle service contract industry saying in 2018, they received 500 complaints involving 50 companies based in the St. Louis area. Customers complained about misleading advertising, difficulty canceling their policies, and policy administrators failing to cover repairs. "Some of the items that are excluded, aren't stated, you just can only assume whatever is included that's all it covers," Barnett said. Floyd hates that he still sees the CarShield ads that convinced him to give them a call. He paid them $118 every month, but said they never held up their end of the bargain. "They are preying on the vulnerable, disability, the elderly, and people like us, people that can't afford to have their vehicles serviced and pay for it out of their pocket," he said. 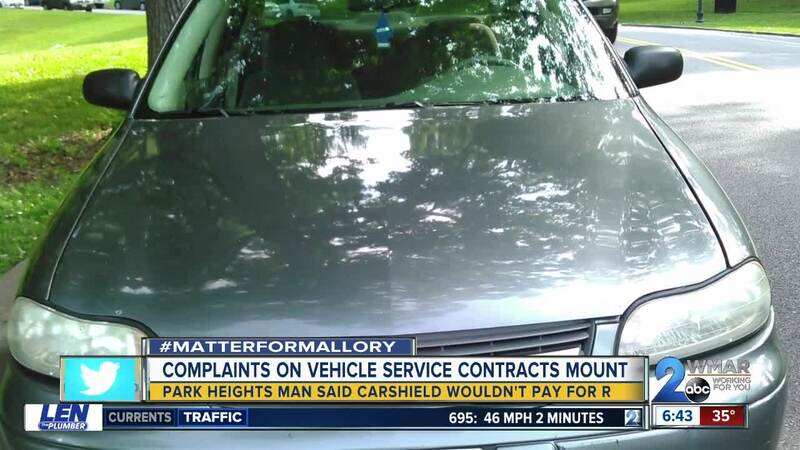 WMAR-2 News Mallory Sofastaii reached out to CarShield and American Auto Shield for comment. This story will be updated with their response. If you have a Matter For Mallory, she wants to hear from you. You can email her at Mallory@wmar.com or use the form below.